Cook dal in 2-3 cups water and set aside. Cook zuchini, carrot and potato in 2 cups water with turmeric powder, chili powder, cumin powder and salt. 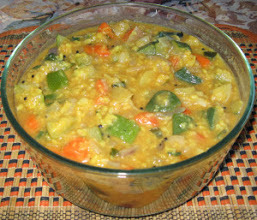 Mix cooked dal and vegetables. Add additional chili powder or salt, as needed. Boil and then simmer for 10 min. Remove from heat. Heat oil in a sauce pan, add mustard seeds and cover the pan. When the seeds have popped, add onions, cayenne pepper and curry leaves, stir until onions are lightly browned, and then pour into the dal-vegetable mixture. Moong dal can be substituted with Toor dal. Also, other vegetables like cauliflower, cabbage, broccoli, beans or peas can be added. Place the butter in a large mixing bowl and beat until softened. Add sugar and beat until light and fluffy. Gradually add the egg and beat until just incorporated. Add flour and salt, then mix just enough to form a ball. Cover with plastic wrap and refrigerate for about an hour. On a lightly floured surface, roll out the dough into a 12" diameter circle of uniform thickness and gently transfer to a 8"-9" tart pan with a removable bottom. Lightly press into bottom and sides of the pan and roll rolling pin over top of pan to remove excess pastry. Cover and allow to rest in refrigerator for 30 min. Line tart pan with parchment paper, fill with pie weights or beans and bake in a preheated 400 deg oven for 20-25 min until the crust is lightly browned. Remove the weights and parchment paper. Cool the crust on a wire rack. Heat a large skillet and melt 1 tbsp butter, then stir in 3 tbsp sugar, the lemon zest, and ¼ tsp cinnamon. Add the cubed apples and cook over medium heat until the apples are soft. Gently mash the apples and stir the mixture until most of the liquid has evaporated. Remove from heat and let cool. Melt 1 tbsp butter in a large skillet over medium heat and stir in the other 2 tbsp of sugar and ¼ tsp cinnamon. Add the sliced apples and gently stir until they begin to soften. Set aside to cool. Place the tart shell on a baking sheet and transfer the applesauce mixture into the tart shell. Arrange the apple slices over the applesauce, and brush with 1 tbsp melted butter. Bake in an oven preheated to 350 deg F for 25-30 min, or until the apples are slightly browned and soft. 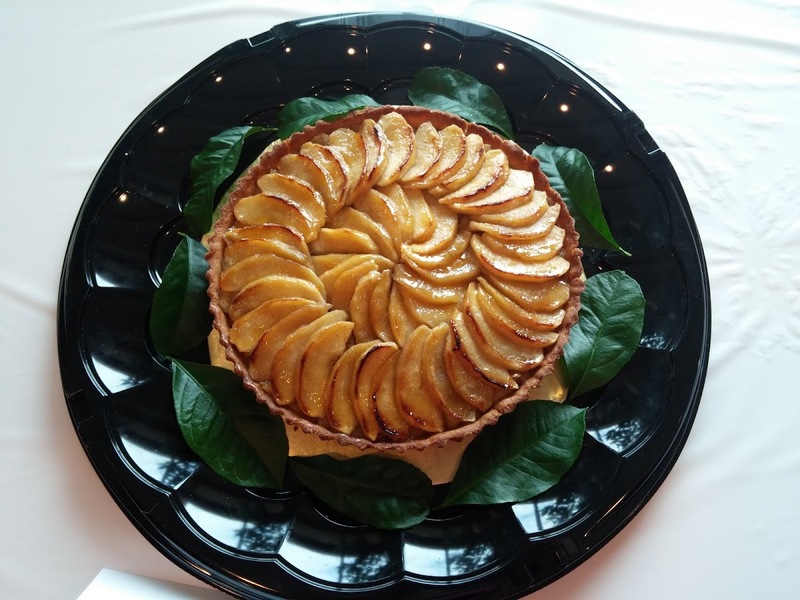 Remove from oven and sprinkle the tart with 1 tbsp sugar, cover the edges of the tart with foil, and broil it for 3-5 min, until the edges of the apples are golden brown and crisp. Allow the tart to cool slightly. Mix apricot preserves and water in a saucepan, bring to a boil and then pass through a strain to remove lumps. Glaze the apple slices with warm apricot glaze.